(On display at Coventry Gardens) Morton's Katz's The Sisters positions itself on the border between objective and subjective truths. Though both sisters are constructed out of the same essential steel template, each form is defined by its own posture. Each sister possesses a distinct personality representing the important individuality that characterizes every faithful relationship with God. Spiritual leadership is apparent in the strength of the Mother Superior figure, which is located just slightly ahead of her companion. Each sculpture portrays a distinct model for a life in prayer and service. 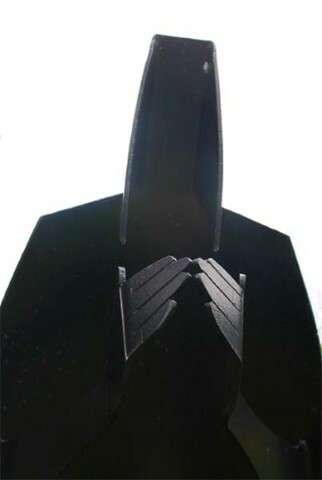 In this abstracted black sculpture, the concept of faith is presented in its most human terms. Though the material, the colour and the template remain objective and constant, each piece must channel these materials in its own way. Each one is literally bent into its own personal subjectivity. The sculpture also serves as an important historic marker, honouring the long tradition of presence and personal strength displayed by the Ursuline Sisters who owned and operated Glengarda Centre and School on this land from 1935-1996. 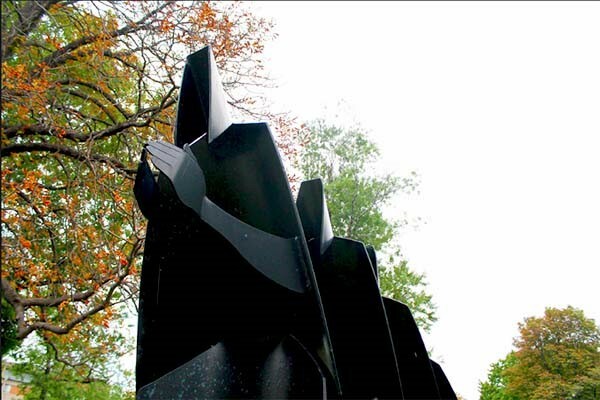 Though each sister in Sisters II is constructed out of the same black finished steel template and all stand 9' high, every form is defined by its own posture. Every sister possesses a distinct personality representing the important individuality that characterizes every faithful relationship with God. Spiritual leadership is apparent in the Mother Superior figure, which is located just slightly ahead of the others. 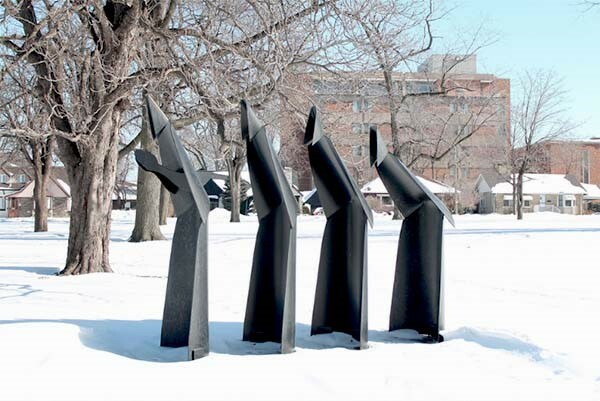 In the clustered three novitiates, each sculpture portrays a different model of a life in prayer and service. Sisters II is a replica of one of Katz's earlier sculptures, Sisters. It can be found in Coventry Gardens and serves as a marker honouring the Ursuline Sisters who owned and operated the Glengarda Centre and School on that land for more than 60 years.